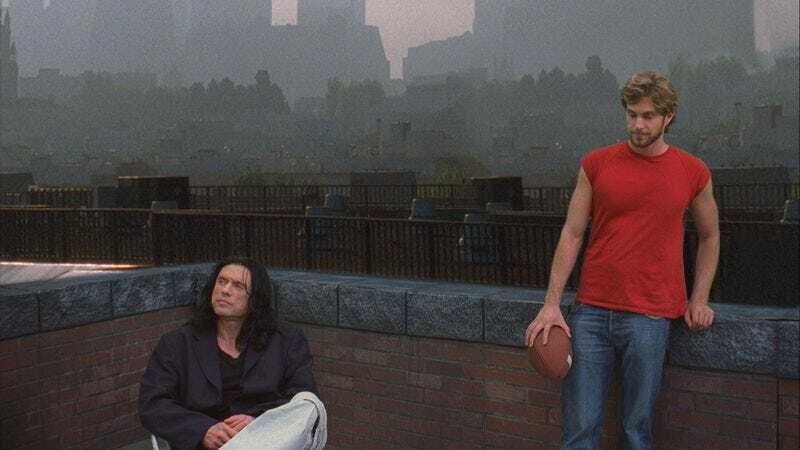 Greg Sestero starred as Mark in 2003’s The Room, a film that might have been lost to history if it were only terrible—instead of grandly, incredibly, unbelievably terrible. Since its release, the movie and its director have become a cottage industry. Tommy Wiseau turned ridicule into dollars, and he now claims that The Room was a dark comedy all along. (It wasn’t.) In this exclusive look at the author’s note to his new book about the experience, The Disaster Artist: My Life Inside The Room, The Greatest Bad Movie Ever Made, Sestero begins to describe the surreal experience. The book comes out October 1, and it’s got a new cover now—see below the piece. Imagine a movie so incomprehensible that you find yourself compelled to watch it over and over again. You become desperate to learn how (if) on earth it was conceived: who made it, and for what purpose? This book is about what might be the world’s most improbable Hollywood success story. At its center is an enigmatic filmmaker who claims, among many other things, to be a vampire. This man speaks with a thick European accent, the derivation of which he won’t identify. He also refuses to reveal his age or the origins of his seemingly vast fortune. His name is Tommy Wiseau; and the film he wrote, directed, produced, starred in, and poured $6 million dollars into is a disastrous specimen of cinematic hubris called The Room. The Room is—despite its ostensibly simple plot—perhaps the most casually surreal film ever made. To put it simply, The Room doesn’t work in any way films have evolved to work over the last century of filmmaking. It’s filled with red herrings, shots of locations that are never visited, and entire conversations comprised of non-sequiturs. It is, essentially, one gigantic plot hole. For many, experiencing The Room is both wildly exhilarating and supremely dislocating. The film engenders an obsessive fascination, instantly luring you into its odd, convoluted world. Tommy Wiseau intended The Room to be a serious American drama, a cautionary tale about love and friendship, but it became something else entirely—a perfectly literal comedy of errors. Yet since its 2003 release, The Room has spread across the United States, and now the world, with viral unstoppability. Many believe that The Room’s unfathomable incompetence elevates it to something like Bizarro-world brilliance. It’s revered for its inadequacy and its peerless ability to induce uncontrollable laughter from beginning to end. It may be the most wonderfully terrible one hour and thirty-nine minutes ever committed to celluloid. In 1998, as a 19-year-old aspiring actor, I enrolled in an acting class in San Francisco. It was there that I met Tommy Wiseau, an encounter that had an unforeseeable impact on the direction of my life. Tommy and I were opposites in every perceivable way, although we shared a common dream: a career in entertainment. This chance meeting inspired a journey neither I nor anyone else could have imagined. This book is a personal account of that journey—the one that led to the phenomenon that is The Room. It is, I hope, a tale of heart, sadness, and blind artistic courage. The story it tells is as much about the power of believing in oneself as it is about the perils that can arise in conquering self-imposed limitations. The conversations and events depicted herein are true and have been rendered as I recall them. The material in this book not derived from my observations and experience is the documented result of on-the-record interviews with Tommy and other persons concerned. I have also used as reference The Room’s original script, photographs, and hours of behind-the-scenes production footage. The footage in particular was used to accurately describe scenes related to the filming process. Minimal liberties have been taken to streamline the narrative. In combining and condensing some conversations or events, I have done so with the hope of maintaining their integrity while also accurately capturing their mood and spirit. Upon its debut, The Room was a spectacular bomb, pulling in all of $1,800 during its initial two-week Los Angeles run. It wasn’t until the last weekend of the film’s short release that the seeds of its eventual cultural salvation were planted. While passing a movie theater, two young film students named Michael Rousselet and Scott Gairdner noticed a sign on the ticket booth that read: NO REFUNDS. Below the sign was this blurb from a review: “Watching this film is like getting stabbed in the head.” They were sold. The Room mesmerized Rousselet and Gairdner. They rallied others to experience the film and soon enough a cult was born. These young men and women created many of The Room’s now-famous audience participation rituals, and for several years served as the vanguard of an unofficial underground fan club. They simply wouldn’t let the film die, going so far as to camp outside one theater to demand its continuance. The combination of their enthusiasm and Tommy’s hapless guerrilla marketing made the film an L.A. in-joke and an entertainment industry curiosity. Before long, the cream of Hollywood’s comedy community developed a particular affinity for Tommy’s film, hosting private Room parties and parodying it in their work. Slowly, the film’s cult status gained momentum, and by 2009, The Room had entered the mainstream. It was featured in Entertainment Weekly, Time Magazine, Harper’s Magazine, and covered on CNN, FOX News, and ABC World News; it also began airing annually on national television. Following the media blitz, The Room emerged as a top selling independent film, and to this day it screens to sold-out crowds worldwide. The magic of The Room derives from one thing: No one interprets the world the way Tommy Wiseau does. He is the key to The Room’s mystery as well as the engine of its success. Tommy had always predicted his film would become a classic, embraced worldwide—a notion that could not have seemed less likely. Yet he was right. The Room became every bit the blockbuster that Tommy had envisioned, though not, of course, in the way he envisioned. Despite The Room’s reputation as “the Citizen Kane of bad movies,” Tommy continues to believe that his is the greatest film of all time. In the end, the phenomenon of The Room has allowed me to realize that, in life, anything is possible. The Room is a drama that is also comedy that is also an existential cry for help that is finally a testament to human endurance. It has made me reconsider what defines artistic success or failure. If art is expression, can it fail? Is success simply a matter of what one does with failure? Many of us want to embark on a creative life and never take the chance—too stifled by our self-awareness or fear to try. All the odds were against Tommy Wiseau becoming a filmmaker, yet something pushed him to go for it—something powerful enough to inspire a global phenomenon. Ten years after wrapping The Room, and living my life in its strange wake, I realize how much the experience has changed me, and how grateful I am for that. By now millions of people have stood before the great, mysterious closed door that is The Room, peering through its keyhole with a mixture of joy and bewilderment. My hope is that I have unlocked this door and welcomed everyone, at long last, inside. From The Disaster Artist by Greg Sestero with Tom Bissell. Copyright © 2013 by Greg Sestero and Tom Bissell. Reprinted with permission from Simon & Schuster, Inc.